It's given up on the monthly torture of seeing its sales fall, in favour of a six-monthly report through the industry's auditor. That makes it all the more of a shock to find the Scotsman's active sales dip below 30,000, its January to June average sale down by more than 17% on the first half of last year. This comes on the same day that the paper's owner, Johnston Press, wrote off quarter of a billion pounds in asset valuation of its titles and print plants. That's part of Ashley Highfield's plan to turn it around and point it in a digital direction. The best Johnston could say was that it's raised its first-half operating profit for the first time in seven years, and digital ad revenues are up. In the case of the Scotsman, that's helped by the industry data showing 120,000 online browsers on the average day, nearly double the level of its Herald rival in Glasgow. Not so great is the 10% decline in Johnston Press's total revenue, the 13% fall in all ad revenues, with reassurance that the trends were beginning to look better by the back end of the half-year. It's reduced its debt mountain by £55m to £306m, but there's a catch. "It is appropriate for the directors to recognise a material uncertainty, which may give rise to significant doubt over the group's ability to continue as a going concern." According to the official statement, it would take a lot of things to go badly wrong, and simultaneously, before banking covenants are broken. But it's a very unwelcome indication of vulnerability. On the broader picture of the six-monthly sales figures, John McLellan, who used to be editor-in-chief at the Scotsman and will soon take over as the director of the Scottish Newspaper Society, reckons there may be a central belt problem for newspapers. The big falls are for the titles seeking to be national in their appeal. Those that serve their own regional patch - the Courier, down by 7% to 52,300 and the Press & Journal, down by 5% to 65,500 - are holding on to readers rather better. And the Paisley Daily Express, though selling merely 7600, stands out for putting on sales while all around them fail. There may be something about the state of the nation in that observation. In reporting this for TV, I heard from Prof Raymond Boyle, a communications expert at Glasgow University, who observed that newspapers can no longer be seen as carrying a sense of Scottish national identity. That's something of an irony at this extraordinary juncture in Scotland's political life, but it may also be a pointer to the electorate's thinking. Newspaper people, among whom I still count myself after 19 years in the trade, can obsess about these circulation changes over a month or a year. It should be as important to look at the online readership, where that's available and meaningful. It rarely is. The important numbers are how well newspapers are faring behind paywalls. The unofficial figures from those who work at Rupert Murdoch's News UK, including the Times and Sunday Times, is that the numbers are looking quite good, but they're not yet being officially audited and published. The bigger picture requires the longer view. I've taken a look at the figures from ten years ago. In 2003, as Jack McConnell was returned as First Minister, and George W Bush declared "Mission Accomplished" in Iraq, The Herald cost 50 pence. It's just put its cover price up to £1.20 - not an inflationary rise, but a multiple. Sales in the UK national daily market have fallen by 33% over those ten years, according to the ABC figures. The Sunday market has been messed up by the sudden departure of its dominant force, the News of the World, but in total, it's down 44%. Scottish national titles are down by more. 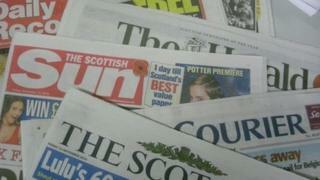 The Daily Record, the Scotsman and the Herald have seen their sales fall by more than half. So too with Scotland on Sunday and the Sunday Herald, now down to 24,900 (and down 13% on last year). There's also the Sunday Post, which held the world record for market penetration 40 years ago. It fell 14% in the year to June and 56% in the decade, to reach 239,000, only 170,000 of those sales in Scotland. Can it go on like this? Many in and outside the industry wonder how low sales can go while a newspaper can be viable, in terms of its journalism, production or distribution costs. The lesson learned so far is that publishers can continue to turn profits so long as they can continue to slash costs. The consequences of that are being felt at the Herald, where a second strike ballot over redundancies has been backed by journalists this week. And Johnston Press's reassurance to its lenders is that the vigorous cost controls go on. But cost-cutting isn't much of a long-term strategy. Ashley Highfield, at Johnston Press, is one of those media corporate chiefs trying to find a new business model that gets sufficient revenue out of digital advertising sales. None of them has yet found the solution. It's likely that there will probably be several different solutions for different bits of the market. And having failed to adapt in the 20 years since the internet began to challenge newspapers' centuries-old business model, some may not find that solution.